Tevis Cup Ride Director Chuck Stalley is interviewed by Matt Scribner for episode #9 of Tales from the Tevis Trail. The Keep Your Dreams Alive Contest winner is, drum roll please,.... Terrie LaPorte of Delta, British Columbia! Her story tugs at the heartstrings of any horse lover. After the sudden and tragic loss of her first Tevis prospect, Terrie acquired Magnum El Shah and worried it was a mistake. He was a very challenging horse. She explained that it took two years for horse and rider to form the strong bond they have today. Now at 67 years young, she and her horse Magnum have completed nine endurance rides and earned seven top ten finishes in 2018 alone She is thrilled to have won and sees this as "a sign to continue doing my best, being a good teammate to Magnum and smiling all the way as I do my thing, living the dream." Congratulations to this Canadian and the best of luck on July 28! Mark your calendars for the 2018 Distance Horse National Championships at the Spook Run Site in Henryville, Ind., running October 26-28. We welcome back our returning partners, the Appaloosa Horse Club and the Paso Fino Horse Association, and our 2018 additions, the Performance Shagya-Arabian Registry, the American Morgan Horse Association and the Akhal-Teke Association of America! We are very excited to have all of these great organizations on with us and hope to see all breeds there! Don't forget we also have several AHA/AERC/SERA/OAATS recognized Open Rides running each day that do not require breed membership(s) and have no qualification requirements. To check out the qualification requirements for the National Rides click here! The LD Challenge is a new event this year, which is open to any horse/rider combination that plans to ride all three days (25 miles a day) in the Open LD Rides. The rider must pay the $20 entry fee for the LD Challenge indicated on the Entry Form before the start of the first day's ride. This is in addition to the entry fee for each individual open ride. Because we encourage the very best care of our horses, all the LD riders must reach a 56 for pulse down criteria and will have a CRI in the final Vet Check for each day. On the third day, the entries in the LD Challenge will have a final Vet Check score. The placings and CRI heart rates for each of the three days and the Vet Check at the end of the third day will be converted into a points score. This score will determine the awards for the 1st-5th winners and all completion riders. All rules and point schedule are available on the AHA Distance National web page under Exhibitor Information. Marion Inez (Robie) Arnold, age 72, of Newcastle, California passed away peacefully in the early hours of Friday, June 15, 2018. Marion was a noted horsewoman and pioneer in the sport of endurance riding. Services will be held at Chapel of the Hills in Auburn on Saturday, June 23, 2018, at 10 a.m. Burial, with military honors, will immediately follow at the New Auburn Cemetery. Visitation will take place just before the services at Chapel of the Hills. Marion was born on August 8, 1945 to John and Elizabeth (Kangas) Robie in Sacramento. Marion is survived by her loving son, Wendell C. Arnold of Newark, Calif, her beloved grandchildren Emma, Lilla, and Samuel Arnold, her devoted sisters Wendy Robie of Chicago, and Marcie Chester of Lithia, Fla, her loving nephew Xo Larimer of Berkeley, Calif, cousin Suann Stone of Tahoe, Calif, and many lifelong friends. Inspired by her grandfather, Wendell T. Robie, Marion learned to ride before she could walk. 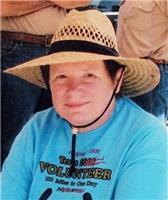 Arabian horses, trail riding and endurance racing became her life's passions. In 1958, at the age of 12, Marion finished the (now) historic 100-Miles-One-Day Western States Trail Ride (colloquially called the Tevis Cup) that was founded by her grandfather. She would go on to finish the ride 10 more times, winning in 1969. Her eleventh and final completion was in 1994 with her son. Shortly after her final Western States Trail Ride, she transitioned to NATRC where she rode and worked tirelessly. She will especially be remembered for a NATRC event that she co-chaired out of Robie Park in Truckee. She was one of the founding members of the American Endurance Ride Conference (AERC) and was elected to their Hall of Fame in 1982. She was also a founding member, and former president, of the Wendell and Inez Robie Foundation. After graduating from Placer High School, class of 1963, as a National Merit Scholar, Marion attended Wellesley College and California State University Hayward, graduating with a major in mathematics, teaching math shortly thereafter. Marion enlisted in the U.S. Air Force during the Vietnam War and cared for newborns at the base hospital at Travis Air Force Base. Marion's family is very proud of her military service. But it was in promoting and celebrating endurance riding and conserving the historic emigrant trails of the High Sierra mountains where she made her mark. Marion will be sorely missed by all who love the mountains and who know we love them best from atop a horse. Karen Chaton is joined by Patti Stedman to tell us just about everything we need to know to get through our first Endurance ride. Heather ‘Flash’ Accardo talks about her preparations for the Mongul Derby and common Endurance acronyms are deciphered, plus we make up a few new ones. Joyce and Dennis Sousa's LV Integrity +\, (LV Cartell x Rivaska) joined the ranks of a few elite endurance horses to become a Breyer horse model. The now-25-year-old gelding has accomplished some amazing feats over his 20 year endurance career, which continues in 2018! With 10,555 AERC mies, "Ritz" became a "Perfect Ten Equine" in 2016 - 10 years of competition, 10,000 miles, 10 first place finishes and 10 best condition awards. Additionally, the gelding became an AERC Hall of Fame Equine in 2015. 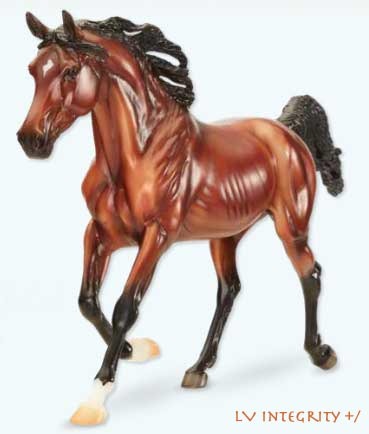 The LV Integrity +/ Breyer model will be in Kentucky for the BreyerFest the second week of July.